As a modern man, you know the importance of taking care of the largest organ on your body. Your skin – especially on your face – is a living billboard that announces your age, health, and vitality, so it pays to take the time to tend to it like you would the rest of your body in order to present the best version of yourself. That said, not all skin care products are created equal. Despite what you may think, the beauty and cosmetic industry is highly unregulated, and many common ingredients found in your everyday skin care products have not only been untested, but could potentially be toxic to your body. That’s why I was pleased to hear from Josh Meyer, CEO of Miami-based Brickell Men’s Products, who, “tired of buying products that were basically female products in disguise and loaded with crappy synthetic chemicals,” decided to create his own line of premium men's grooming and skin care products made with all-natural and organic ingredients. Josh sent me some samples of Brickell’s best-sellers like the Face Moisturizer and Hand Balm, and I was very impressed with the results. Both are very smooth and highly nourishing, quickly absorbs into the skin, and leaves just the right balance of moisture for a well-conditioned, comfortable skin feel – all without leaving a greasy residue, which no one likes. I also tried the Shave Cream on my arm pits (even with my love for all things men’s-related, I have yet to sprout a beard) and found it to have a dense creamy texture that helped lift the hair for a close shave, and left the shaven area soft and supple with no irritation and redness. In fact, I had such buttery skin afterward that I kept pawing at my pits all night long! So, as a passionate advocate of natural skin care, coupled with having met Josh and experienced his superb line of products made just for men, I decided to ask him for some skin care tips for my male readers while also helping to spread the word about his fine offering of all-natural, organic lotions and potions for men. 1. Do men really need skin care products made specifically for men? They do. Men's skin is thicker (25% thicker), has more pores, is oilier, and sweats more. Men also, of course, have facial hair. This creates some unique challenges and requires different formulations/ingredients to account for these differences versus a female-oriented product. 2. What’s the top mistake men make in their skin care routine, and how do they correct it? Not doing anything or just using soap (on their face). They can correct this by following a very simple skin care regimen: wash their face morning/night and use a light facial moisturizer morning/night. After a few weeks, they'll notice clearer, firmer skin and over time will reduce/prevent signs of aging. 3. Most guys prefer to keep things simple. Is it okay to use the same moisturizer for the face and body? I wouldn't suggest it. Body lotion can often have ingredients that will clog the pores of the face and with facial moisturizer being more expensive, it would get costly to use on the body. Each type of moisturizer really is formulated for a specific use. 4. Should men adapt their skincare to the changing seasons? What’s your advice for switching between summer and winter? Personally, I don't as my skin's condition stays about the same year round. But, everyone's skin is different and has varying sensitivities to the change in weather. Winter can often mean much drier skin due to the air, wind or activity level (being on the slopes all day). Cream based skin care products are better for the winter as they're thicker and keep the skin moisturized longer, while a lotion/serum based moisturizer is best for summer as it's lighter and won't feel heavy on the skin during hot months. 5. What are some changes that happen to the skin as a man ages, and how should he address that? Guys are much luckier in the aging department than women because of thicker skin and higher collagen density. Fine lines appear the older you get because your cells produce less collagen (the structural protein of the skin), causing your skin to appear thinner and looser. The less collagen your skin has, the less water it can retain, causing structural folds (wrinkles/lines). The best defense is a good offensive strategy: Moisturize the face daily and if your budget can afford it, buy a good anti-aging product. There is no fountain of youth, but over time, you will see noticeable results. 6. What makes natural ingredients better than the stuff synthesized in labs? One word: toxins. The US government is rather lenient on what companies put into bottles and sell you. Almost 90% of the over 11,000 grooming and skin care ingredients known to the FDA have never been evaluated for safety and many of them are known toxins (causing ailments, cancer, and other health issues). Your skin absorbs anywhere from 64% to 100% of anything you put on it due to its porous nature, so if the products you use have toxic chemicals, they are being directly ingested into your body from your skin. 7. What are some key natural ingredients men should look out for and how do they benefit the skin? Aloe Vera: One of the best natural ingredients you can put on your skin. It has many benefits including moisturizing, anti-aging, and cleansing. Jojoba: A seed which defends your skin by building a protective cushion around it, helping lock in moisture and prevent free radicals (damaged cells) from forming. Shea Butter: A good, natural fat, filled with vitamins your skin craves such as A, E, & F.
Coconut Oil: Helps remove dead skin cells and strengthens the underlying skin tissue. Alpha Hydroxy Acid: Found naturally in sugar cane, a large amount of research shows it helps fight skin aging. Also, if a product claims to use natural ingredients, check the label. If the natural ingredients are towards the bottom of the ingredient list, then there is probably a very trace amount of them in the actual bottle. 8. Lastly, tell us your story. What inspired you to create Brickell Men’s Products? Thinking there’s no way I'm putting that on myself, it caused me to go on an investigation spree where I learned how toxic all these ingredients were to the body. I tried to find more natural/organic products that were geared towards men and there were few, if any, and nothing I wanted to display in my bathroom or throw in a gym bag. So, being an entrepreneur, I took it as an opportunity based on reading a statistic that showed in 2013, men spent more on toiletries (skin care, grooming) than on shaving products for the first time in history. And that’s how we came into existence. It’s clear that skin care is no longer just the domain for women. So gentlemen, no more borrowing products from your woman’s stash – get your own supply! There are plenty of men’s skin care lines in the market to choose from, so just as you care about what you put inside your body, do yourself a service by being informed about what you put on it. 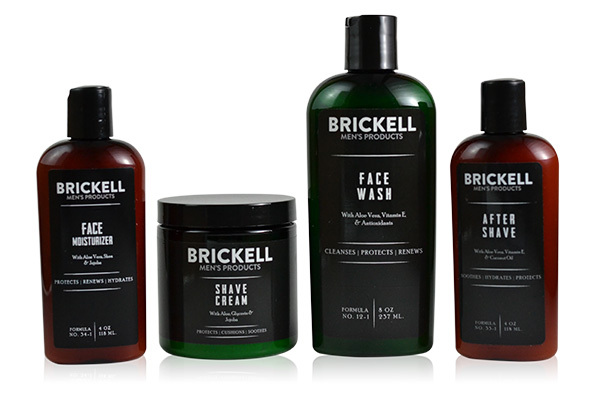 And if you want to give all-natural a try, Brickell Men's Products is definitely worth checking out.